FREE FROM GLUTEN, GRAINS, DAIRY, REFINED SUGAR. SPECIFIC CARBOHYDRATE DIET (SCD) & PALEO. 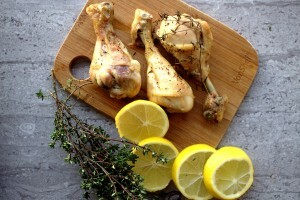 We often cook chicken drumsticks in our house on a Sunday instead of a whole chicken these days. They cook in less time and are packed full of flavour. You still even have the chicken bones for making a stock the next day. I also love having the leftovers cold with a salad so I’ll often do a batch of these Sunday night to have for my lunch for the next two days. Fresh thyme really brings chicken to life and growing your own herbs is so easy and requires little maintenance (or so my husband tells me!). Our local supermarket often does special offers on free range chicken drumsticks so we stock up when we can. Considering these take only 40-45 minutes in the oven, you’ll be surprised at the depth of flavour. These also make a great party appetizer and are perfect for the holiday season. Deliciously, juicy tender chicken drumsticks baked with fresh thyme, lemon, garlic and onion slices. 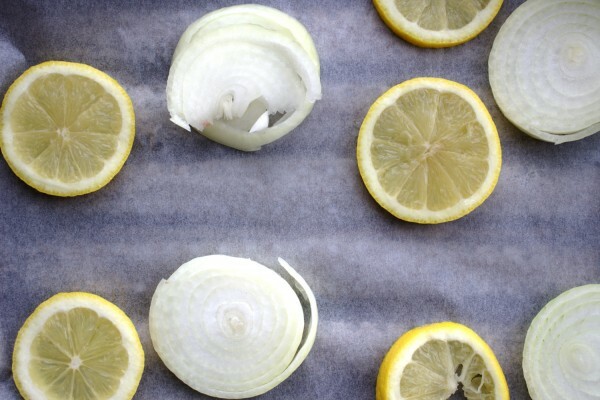 Slice the lemons and onions and lay out on two baking trays lined with parchment paper. 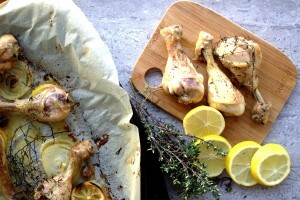 Place the chicken drumsticks over the lemon and onion slices and add the garlic cloves whole (two on each tray). 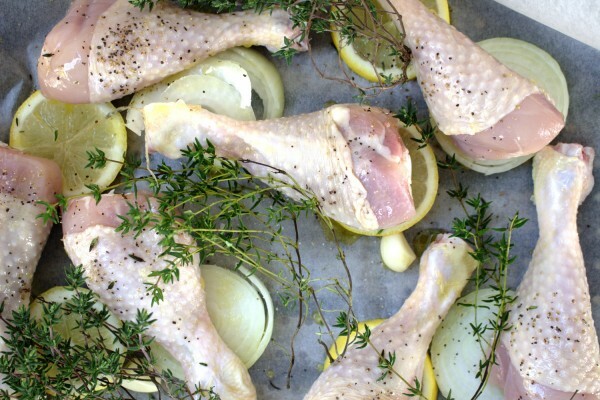 Brush each drumstick generously with olive oil and season well with salt and pepper. Add the fresh thyme to each tray and bake for 40-45 minutes until the chicken is cooked through and the skin nice and crispy. Enjoy with some roasted vegetables or a light salad.